Margaret Robinson trained as a painter at Leeds College of Art and at the Slade School of Fine Art in London during the War. She was always fascinated by marionettes and while teaching at Sibford Friends School in Oxfordshire, she started making puppets with the children. A little later, she ran a Puppet Theatre with a partner, which travelled around Yorkshire giving shows in Schools, Youth Clubs and Women's Institutes. They also travelled abroad, to Germany and Holland. 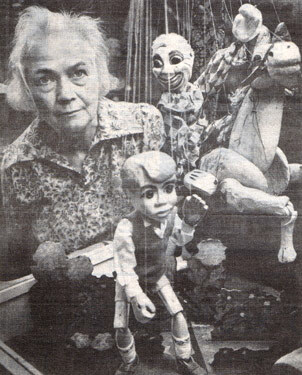 In 1950, she became mask maker for the Northern Children's Theatre and School, run by Esme Church and Molly McArthur and later ran their Puppet Theatre. In 1957, with £20 in the Post Office, she moved to London to seek her fortune in Theatre and Film. It was while she was working as a mask maker for Theatrical Costumiers: "Theatre Zoo", a Company specialising in animal masks and costumes, that she met her future husband, Bernard Robinson. Bernard was Production Designer for Hammer Films at Bray Studios, working on "The Hound of the Baskervilles" and asked Margaret to make a head dress to make the hound look more ferocious. The studio felt that the already quite fierce great dane who was to play the title role would look even fiercer if his ears stood up instead of drooping (a nurse was kept on permanent stand-by while Margaret fitted the mask). She returned to Bray to make masks and models for many more films such as "The Mummy" (1959), and the floor-to-ceiling griffins in "The Brides of Dracula" (1960). Margaret married Bernard Robinson in 1960. She imagined she would be embarking on a life of exciting parties and prepared herself to do the business entertaining that she assumed would be part of Bernard's life. However, this was not to be the case. Bernard said that he had never entertained or gone drinking to get films. "If my work isn't good enough to get me jobs, then I'll do something else." Bernard made 76 films in his career as Art Director or Production Designer from 1946 to 1969 including "Dracula" (1958) "The Revenge of Frankenstein" (1958), "The Hound of the Baskervilles" (1959), "The Mummy" (1959), "The Curse of the Werewolf" (1960), "The Two Faces of Dr Jekyll" (1960) and "The Phantom of the Opera" (1962). He had also worked on numerous earlier films, such as "The African Queen" as a draughtsman before the war. He died in 1970 at the age of 57. "It's not the length of life that counts," he is quoted as saying, "but the quality." Eventually, Margaret returned to teaching puppet-making and painting to Adult Education Classes in Runnymeade, using the resourceful approach of her early years with inventive use of materials in the cause of puppetry.